Whirlpool W10135699 Affresh Washer Cleaner removes and prevents odor-causing residue that can occur in all brands of HE washers. 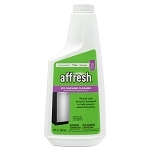 While bleach only kills odor-causing bacteria leaving behind the detergent residue, Affresh Washer Cleaner uses surfactant chemistry to remove the root problem. Affresh cleaner is a formulated, slow-dissolve, foaming tablet that gets under residue, breaks it up, and washes it away leaving the washer smelling fresh and clean. Simply place one tablet in the wash basket (without clothes) and run a Normal Cycle (hot option) or Clean Washer Cycle. 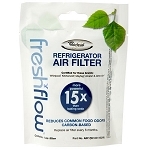 Affresh brand is environmentally friendly, safe on septic tanks, and safe for all washer components. Package includes three tablets. I use this product once a month as recommended by the manufacturer to keep my high efficiency washer clean and I have never had any problems. My neighbor had the same washer and did not use this product and his washer developed a smell. It''s a very simple easy monthly step and my washer smells clean. A: I called Whirlpool because of the musty smell coming from my washer. This product was recommended to me. My washer is only 5 years old. A: Our washer needs a good cleaning.....saw it as a possible add on on your website.